Montana Democrats are banking on a long-shot liberal Senate candidate to replace the disgraced John Walsh, but their choice might be too radical even for the increasingly extreme party. Democrats are hoping that Montana state representative Amanda Curtis will be the next Elizabeth Warren: an outspoken and unapologetic liberal who can fire up the base and raise big bucks from like-minded benefactors. 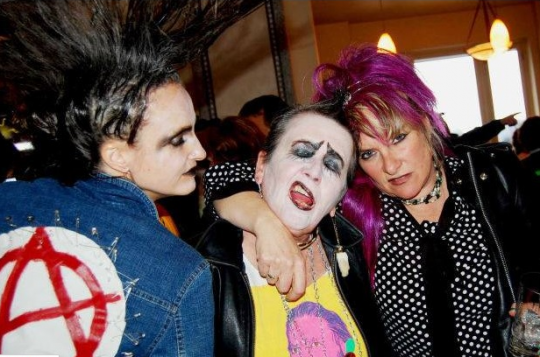 A self-described "punktuator" who has been seen sporting a mohawk and studded denim jacket with the iconic anarchist "A," Curtis is certainly distinct from most Montana politicians. Sen. Jon Tester (D., Mont. ), the state’s incumbent senator, is the upper chamber’s only active farmer. Curtis’ Republican opponent, Steve Daines, is a successful businessman. Walsh is a career Army officer. Curtis, by contrast, is a teacher and an activist. She is an outspoken supporter of organized labor, and has endorsed some of its most radical historical leaders. In 2008, Curtis penned two articles for the monthly newspaper of the Industrial Workers of the World, a far-left labor group. One of the pieces, which reported on IWW recruiting activities at a Montana folk music festival, quoted "IWW member Kevin Curtis," who is Ms. Curtis’ husband (that fact was not disclosed in the article). Mr. Curtis is the Butte delegate for IWW’s Montana affiliate, the Two Rivers General Membership Branch. According to that group’s website, it is "working to organize the people of Montana into the One Big Union to end wage slavery and eventually end the capitalist system." The umbrella IWW organization has a similar goal. "It is the historic mission of the working class to do away with capitalism," the preamble to its constitution states. "The army of production must be organized, not only for everyday struggle with capitalists, but also to carry on production when capitalism shall have been overthrown. By organizing industrially we are forming the structure of the new society within the shell of the old." IWW’s website lists Kevin Curtis as an officer of the Two Rivers GMB. His listed phone number is the same number provided on Amanda Curtis’ official state representative website. Curtis has extensively documented her own political views in numerous YouTube videos and Facebook posts that give her take on Montana politics and other hot issues of the day. On Saturday, Montana Democrats selected Curtis to replace Walsh, who withdrew from the race after it was revealed that he had plagiarized his final paper at the Army War College. Republicans drew from Curtis’ extensive YouTube commentary to portray her as too far left to be a viable statewide candidate. A compendium of clips compiled by the Republican Party of Montana featured Curtis mocking Christianity and concern over the U.S. national debt, and insisting that "you have to have an abnormal brain" to vote against Medicaid expansion in the state. "I’m not worried about anything being taken out of context in those videos, because they’re the public record," Curtis told the Washington Post. "They’re available for anyone to go back and see exactly what I said and in what context I said it." However, Curtis appears to have realized that some of the more colorful elements of her online personality could be a liability. On Thursday morning, she deleted or made private photos of her in full punk rock garb after they began circulating on twitter. Another Facebook photo showed Curtis gathered with IWW members at the grave of Frank Little, a member of IWW’s executive board in the early 20th century who dubbed American soldiers during the First World War "Uncle Sam’s scabs in uniform." On her Facebook page, Curtis recently shared a missive from her husband that quoted labor leader William Sylvis warning of a "war between poverty and wealth." "This moneyed power is fast eating up the substance of the people," the quote said. "We have made war upon it, and we mean to win it. If we can, we will win through the ballot box; if not, then we shall resort to sterner means." 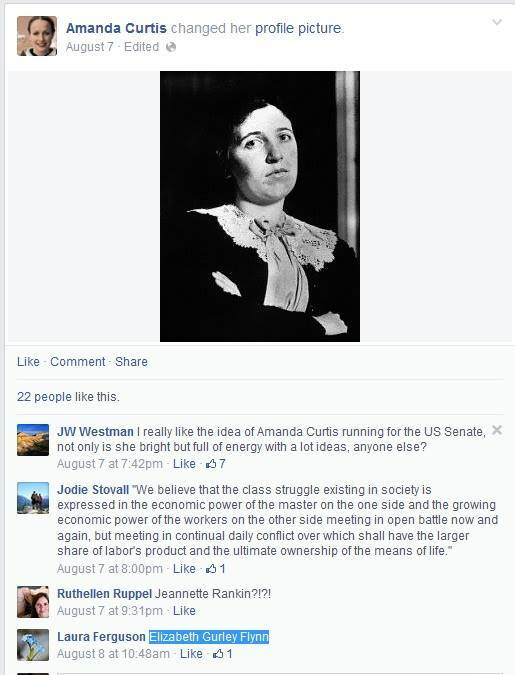 On Aug. 7, the same day that Walsh withdrew from the race, Curtis changed her Facebook profile picture to a photo of Elizabeth Gurley Flynn, a labor organizer that the Two Rivers GMB says is "important to our history as well as the struggles of the working class." Flynn was the chairwoman of the National Committee of the Communist Party of the United States. She died in 1964 during a visit to the Soviet Union. Soviet premier Nikita Khrushchev gave her a state funeral in Red Square. Conservative groups are seizing on Curtis’ more outlandish statements to paint her as a radical. "Apparently, in 2014 plagiarism is beyond the pale in the Democratic Party, but revolutionary socialism is perfectly acceptable," wrote Phil Kerpen, president of the group American Commitment, on Thursday. Curtis’ campaign did not respond to a request for comment.